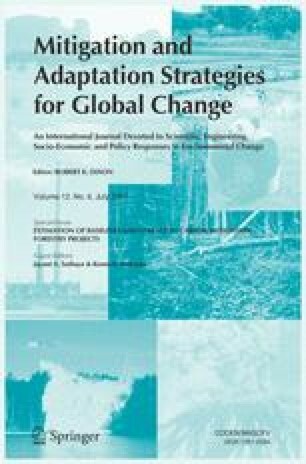 Setting a baseline for carbon stock changes in forest and land use sector mitigation projects is an essential step for assessing additionality of the project. There are two approaches for setting baselines namely, project-specific and regional baseline. This paper presents the methodology adopted for estimating the land available for mitigation, for developing a regional baseline, transaction cost involved and a comparison of project-specific and regional baseline. The study showed that it is possible to estimate the potential land and its suitability for afforestation and reforestation mitigation projects, using existing maps and data, in the dry zone of Karnataka, southern India. The study adopted a three-step approach for developing a regional baseline, namely: (i) identification of likely baseline options for land use, (ii) estimation of baseline rates of land-use change, and (iii) quantification of baseline carbon profile over time. The analysis showed that carbon stock estimates made for wastelands and fallow lands for project-specific as well as the regional baseline are comparable. The ratio of wasteland Carbon stocks of a project to regional baseline is 1.02, and that of fallow lands in the project to regional baseline is 0.97. The cost of conducting field studies for determination of regional baseline is about a quarter of the cost of developing a project-specific baseline on a per hectare basis. The study has shown the reliability, feasibility and cost-effectiveness of adopting regional baseline for forestry sector mitigation projects. This work was supported by the U.S. Environmental Protection Agency, Office of Atmospheric Programs through the U.S. Department of Energy under Contract No. DE-AC02–05CH11231. Disclaimer: The views and opinions of the authors herein do not necessarily state or reflect those of the United States Government or the Environmental Protection Agency. The authors would also like to thank the Ministry of Environment and Forests for supporting and encouraging the research activities on climate change at the Indian Institute of Science. We also thank Jayant Sathaye and Ken Andrasko for their contribution at various stages of development of this study. This project was conducted under the USEPA-Ministry of Environment and Forests support.